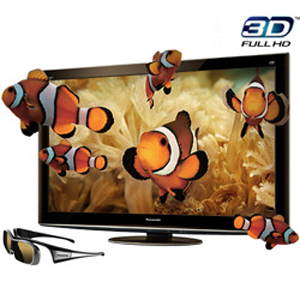 CIS - Lake Norman's #1 Authorized Dealer For Panasonic & Samsung 3D HDTV's! First models available will be 50- and 54-inch versions, with 58- and 65-inchers to be added in June. While the Magnolia/Best Buy VT20 series 3D displays from Panasonic have been available for a little over a month now, the mass-market equivalent VT25 series will be rolling on to store shelves and into homes starting in early May. The first models available will be the 50-inch and 54-inch versions, while 58-inch and 65-inch sizes will trickle out later in June. Tech specs for the whole series, along with 2D plasma and LCD products, can be found at www.Panasonic.com. SRPs on the TC-P50VT25 50-inch model and TC-P54VT25 54-inch model are $2,599 and $2,999, respectively, with availability the week of May 3. There’s not specific date, but the $3,399 TC-P58VT25 58-inch set and $4,299 TC-P65VT25 65-incher are due in June, according to Panasonic. Full HD 3D Technology –- VT25 Series features new, faster screen phosphors (short-stroke) which, when coupled with the VIERA VT25’s 600Hz sub-field drive, outputs alternating imagery at 60 frames per second to each eye. Active Shutter Eyewear—All Panasonic VIERA VT25 Series models come with one pair of Panasonic 3D Active Shutter Eyewear (TY-EW3D10U). Additional pairs of Panasonic 3D Eyewear are available at retail with an SRP of $149.95. Infinite Black Pro Panel –- A new phosphor technology that produces deep blacks (5,000,000:1 native contrast) and vivid images with minimal reflection. THX Certified Display—Ensures that every Panasonic Full HD 3D TV displays motion pictures and TV content with the quality and color palette that the director intended. VIERA CAST WiFi with Skype—Gives viewers the ability to access feature films plus information and communication offerings including Amazon Video on Demand, Bloomberg News, Fox Sports, Netflix, and Skype. Custom Installation Services, LLC - Charlotte and Asheville NC’s Authorized Dealer For Samsung, Panasonic & Sharp HDTV’s! CIS: Charlotte NC's 1st Choice For Home Theater Seating Sales! Built-in electronic features make these the finest seats in the house. Berkline is fusing comfort with electronic conveniences with the introduction of a new line of seating. 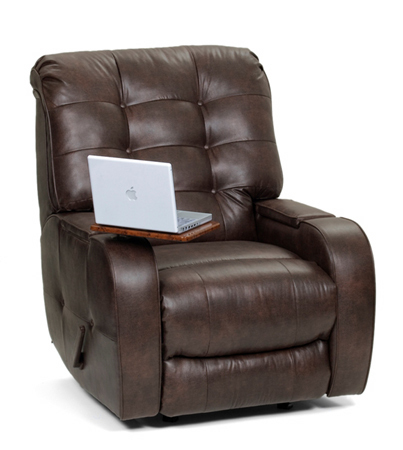 The company’s Laptop Recliner ($649), for example, features a storage compartment in the arm of the chair for storing a laptop computer, iPad, e-reader and other electronic devices. A small swivel-platform can be attached to serve as a small work area. 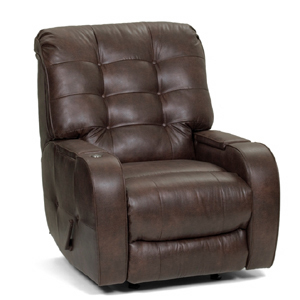 The Concert Series recliners ($699), which were introduced last year, already had some technology built-in, including two stereo speakers and a subwoofer. This year, the recliners will also include a mini audio jack so users can plug in their iPods, MP3 players cell phone and other mobile devices. Lastly, Berkline offers as an option its new eCoupled technology. Developed by Fulton Innovation, it provides a wireless charging station for cell phones, laptops and other equipment. The technology precludes the need for power cords through an electromagnetic conduit combines with an intelligent control system that continuously monitors power flow so various devices—even from different manufacturers—can charge at the same time. Custom Installation Services, LLC - Charlotte and Asheville NC’s Source For Home Theater Seating! Can RadioShack & Other Retailers Sell Home Automation? When I suggested in my January Industry Insider that home automation has never succeeded at retail, I received a harshly worded response from 35-year industry veteran Dave Rye. I concede that X10 does a wonderful job of selling gadgets and covert cameras, but not home automation to the masses. I don’t mean masses of gadget freaks, but masses of ordinary people. And by home automation, I mean integrated lighting and thermostats and maybe a macro or two. Sold, perhaps, but not purchased. We see the same phenomenon today, despite boasts from numerous home-control vendors that their products have been picked up by RadioShack, Lowes, Best Buy and other mass marketers. Picked up by retailers, but are they being picked up by consumers? On a recent trip to my local Shack — the corner store formerly known as RadioShack — I found a very brisk cell phone kiosk. But not a single person gazed at the modest array of X10-like gadgets. Furthermore, dust had settled on the two Schlage Link boxes in the store. Although the boxes — containing a Z-Wave-enabled door lock, wireless Internet gateway, and Z-Wave lamp module — sat on prime shelves, they attracted little interest from passersby. I asked the store associate (a long-time employee): Have you sold many of the Schlages? And then I asked how customers felt about the $12.99 monthly service fee for remote access. And that’s probably the same dialog I would have with the folks at Lowe’s, Best Buy or other popular stores that sell home automation. RadioShack stock is up about 80% over the past year, and the company enjoyed a 26-percent increase in earnings in the fourth quarter. But it was all about cell phones. Phones are easy to sell. Consumers know what they are. RadioShack employees know what they are. Who has the bandwidth to learn about and sell home automation? Not to pick on Schlage. The same can be said of Xanboo, iControl and countless other home-control vendors that have practically abandoned the retail channel. Furthermore, there has not been a single successful home-control initiative involving utilities, telcos, cable and other service providers, despite numerous efforts. Home automation still remains a very assisted sale. Except for the geeks, the real mass market doesn’t understand the stuff, and doesn’t want to install it. So there remains a tremendous opportunity for integrators, even if you’re installing DIY-friendly products like Schlage. Custom Installation Services, LLC - Charlotte and Asheville NC’s Source For Home Automation Products!